Getting back to this game: I've seen plenty of nil-nil's that were great, but this wasn't one of them. The two teams had half-chances at best and, in the case of the Red Bulls, the lack of a Creative Midfielder was only too apparent. Aimless balls from the back, or from the sides, into the box were RBNY's only legitimate options in this snoozer. Where is Amado Guevara when you need him, eh? Nevermind him, I'll take Carlos Valderrama, if he'd come out of retirement, at this point. But seriously, can't we entice someone into coming here who's a legitimate #10? I'm having visions of a certain Frenchman having to drop back into the backline to collect balls. Ok, so please do check out Part one of our always entertaining (at least to us) commentary above. Please click here for part two, click here for part three and click here for part four. If you really must, you can even click here for an important, post match debate about where to get the best hamburgers on this planet. The Red Bulls will now have a three game stretch of MLS games away from home. First up, it's Columbus, @Crew Stadium, this coming Saturday, July 17th. 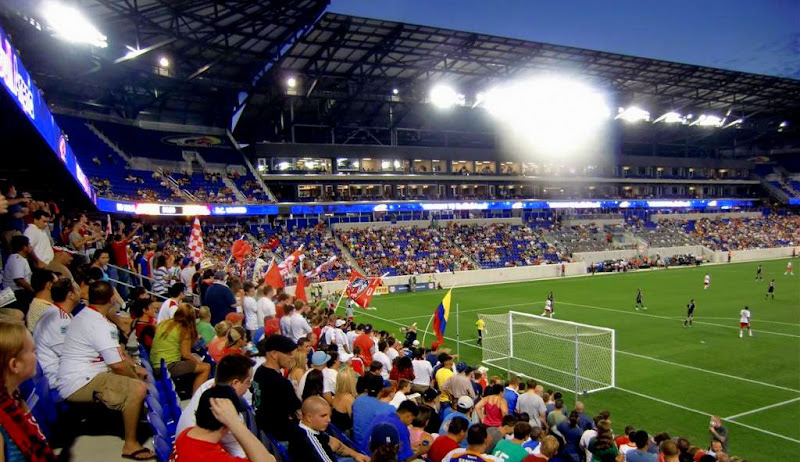 The Bulls will, actually, be back in action @Red Bull Arena on Thursday, July 22nd, against English powerhouse Tottenham Hotspur, in the first game of the Barclays New York Challenge. A meaningless friendly, for sure, but it will probably be our first chance to see our new Designated Player (whomever that may be ;) in action. There is also the rumor of another Designated Player coming, but we'll see what happens with that one. Actually, here are a few interesting tidbits regarding the two rumored Designated Players (salary, length of contract), courtesy of the Three.Four.Three.FC blog. Please click here for my RBNY/DC photo set, or you can click here for the slide show. You can also click here for a great set from our friends @Chamber Images. And here's another great set, courtesy of Red Bulls Official on Facebook. Viper Out!